THE STANDING PILATES® PROGRAM IS FINALLY HERE! The Program comes in two parts. 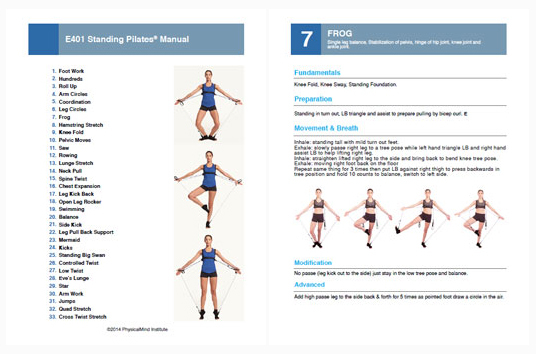 The first features an updated Manual containing 33 exercises over 40 pages with accompanying photos of all the exercises. The second part of the Program is the video portion, in which PMI Instructor Yuu Fujita teaches three different instructors Standing Pilates® for the very first time. The video in particular is very exciting, as it demonstrates the versatility of the Standing Pilates® Program and Tye4®. In the video, Yuu teaches three very different women with very different bodies. All of these women have been in the industry for a while, but it’s inspiring to see that literally anybody can do Standing Pilates® and use Tye4®. Bearing that in mind, you can now purchase the Standing Pilates® Program in our online store!